Book Synopsis: Maris Morton, winner of the Copywrite Limited Agency (CAL) Scribe Fiction Award in 1910, has written a new novel that incorporates a couple of her past vocations. 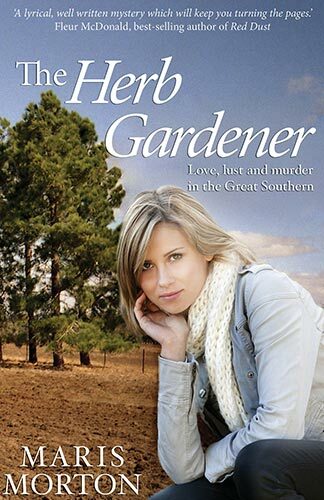 The story revolves around the heroine Joanna and her love interest Chris and the murder of a young carpenter who had been working on Chris’s farm. Joanna is a school teacher, and she, with daughter Mia, has accepted a position cooking for carpenters during the summer school break on a farm owned by Chris Youngman, in South Australia. Joanna and Chris are an ‘item’ but they aren’t widely advertising their mutual attraction. Thrown into the mix are well-heeled, married neighbour Ailsa, a couple of Joanna’s associates from the high school, as well as a few coppers and the small contingency of workmen/carpenters, and Chris’s parents. Morton richly depicts the isolation, vastness and beauty of the property Joanna has come to work on, and realistically describes the rural South Australia landscape. Small town life is also genuinely explored as are the relationships between the characters. At first main character Joanna barely escapes being painted too simplistically; but as the story progresses, Joanna’s character seems to expand and become more believable. In contrast, her daughter Mia is well depicted from the start. The reader can actually visualise this 6 year old. Ailsa, the alluring neighbour, is really over the top, but Morton carries her characterization to a satisfying conclusion. Ailsa definitely adds a bit of spice and spark to this novel, as does carpenter Mickey. The plot line equally develops the relationship of Joanna and Chris as well as the clues adding up to the death of young Jesse. Be ready for an interesting sort of twist to the ending.